Find device-specific support and online tools for your Apple iPhone 8 Plus. Here's how to complete the initial setup of your iPhone 8 / 8 Plus. 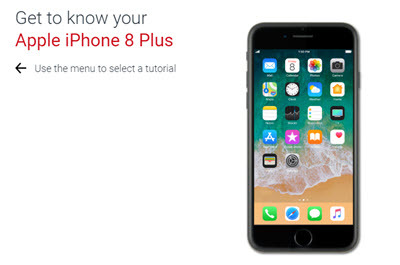 Learn how to set up your new iPhone 8 / iPhone 8 Plus with important features and functions. Get the most out of your new phone with this list of practical tips. An interactive map of the Home screen and buttons on your iPhone 8 Plus. Here's info on the battery specs (e.g., Talk Time, Standby Time, etc.) for your iPhone 8 / 8 Plus. Here's how to enable voice control for number dialing on your iPhone 8 / 8 Plus. Here's how to adjust common camera settings (e.g., flash, HDR, etc.) on your iPhone 8 / 8 Plus. Here's how to set up and change settings for the display lock on your iPhone 8 / 8 Plus. Here's how to unlock your iPhone 8 / 8 Plus if it is secured with a password, fingerprint, etc. Here's how to restore your iPhone 8 / 8 Plus if it crashes, has a blank or frozen screen or connection issues. Here's how to update the software on your iPhone 8 / 8 Plus. Here how's to insert the SIM card into your iPhone 8 / 8 Plus during activation or if it's been removed. Here's how to remove your SIM card to help with activation and browser issues and a blank/frozen screen. Here's how to view the SIM card number on your iPhone 8 / 8 Plus.